A few years ago, i was planning for an expedition, packing and repacking my backpack, trying to squeeze in every last thing that i may need, whilst keeping the overall weight manageable. At some point in this process, I met an elderly lady who, it turned out, had visited almost every single country in the world through a lifelong career with the Red Cross, and she gave me the most useful piece of trekking advice i ever received. She told me to split my luggage into two piles. And then chose which of those two i would take with me. Now, that advice was not perfect: both piles had essential items in, but the principle was sound. You can’t effect weight savings by picking away at the edges. Sometimes you need to reframe the context of the problem. Sometimes you need to focus not on what else you will pack, but on what you will leave behind. Any conversation we have about ‘the next great thing that we are going to do’, should almost certainly have, in parallel, a conversation about ‘the next great thing that we will leave behind’. Things become outdated: processes, systems, methodologies, knowledge, certainty, belief, conviction, dogma, hierarchies, and ideas. And we need to create space for the new by deleting the old. We could convincingly argue that many of our Organisations already have almost everything that they need to be successful, the resources, people, and time, already within their four walls. They simply lack the space, permission, and ability, to liberate them from the clutter of yesterday. So consider this: what can you leave behind. Then pick it up, look at it, respect it, memorialise it, put it down, and never look back. This entry was posted in Social Leadership and tagged Change, Ideas, Leadership, Learning, Packing, Social Leadership, Trekking. Bookmark the permalink. 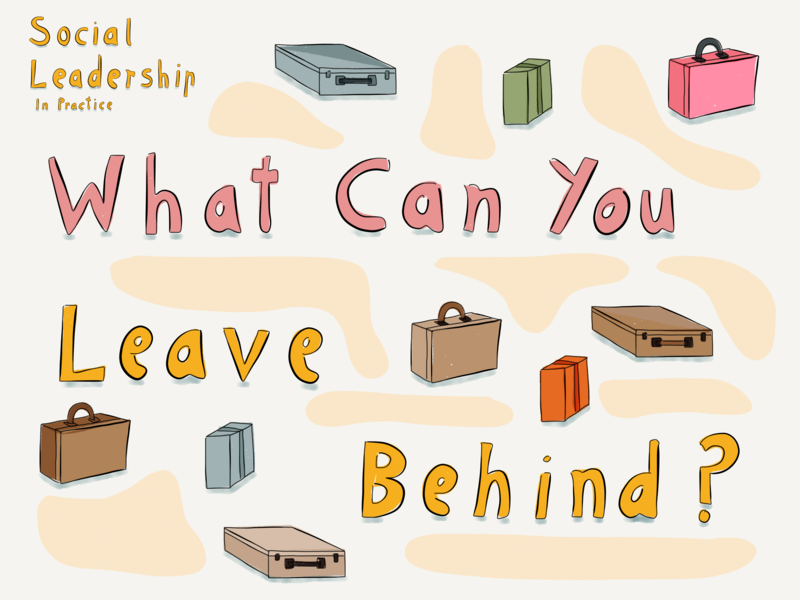 1 Response to What Can You Leave Behind?